*Gorgeous pics of your walk, James. *Johnny, i would have loved to seen a photo of your 300 pipes! Thanks Celestino, I would have loved to see that many pipes too, online vendors don't even keep that many around ! Bees Have No Respect For The Pipewalking Man !!! So Sipping on some solani sweet x, In my Peterson (5th break in smoke), and i feel a pinch on the bottom side of my left foot, stepped into a thorn or something till I looked down and saw my true assailant, a sadistic bee who took it upon himself to show me what he thought of my smoking and bravely got under my foot timing perfectly between my flip and my flop just in time to deliver his crushing blow and fly away ! Beware The Bash Bee ! But, but, but...I LIKE honey! 2. zippo pipe lights work great ! When I go outside to to yard work or to blow/shovel snow in the winter, I always just go out with an old corn cob pipe. I've ruined to many nice pipes over the years because of those windy conditions or extremely cold weather. My good pipes are reserved for indoor smoking or when driving on a trip/vacation. (07-25-2012, 06:57 PM)Johnny Wrote: When I go outside to to yard work or to blow/shovel snow in the winter, I always just go out with an old corn cob pipe. I've ruined to many nice pipes over the years because of those windy conditions or extremely cold weather. a lot of crossover between those things, its to bad the other two (pipes, pens) dont have a forum, well one as nice as this one ! 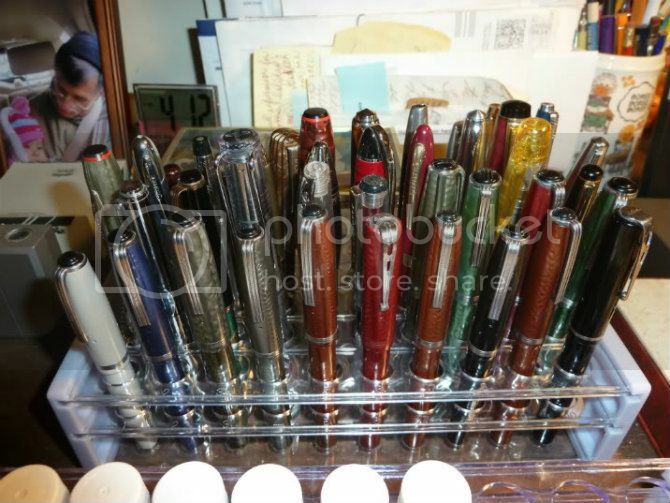 There are a few fountain pen forums and while not bad, none seem to have the homey atmosphere that we have here at TSN. (07-25-2012, 08:41 PM)freddy Wrote: There are a few fountain pen forums and while not bad, none seem to have the homey atmosphere that we have here at TSN. 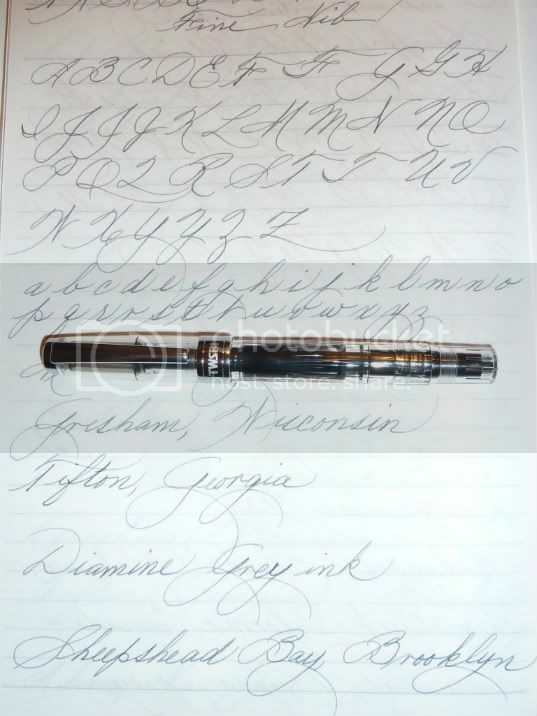 Freddy, i guess it is time for you to start a sub-section for fountain pens, here. i will join. So we'd have two interested members. (07-25-2012, 09:21 PM)freddy Wrote: So we'd have two interested members. I'd be interested in reading, especially if there were tips on improving handwriting! I have one fountain pen, but I hardly use it due to my chicken scratch. (07-25-2012, 10:26 PM)syngent Wrote: Lol "Freddy's fountain flow"
Here are some of my pens along with one of my favorites (a TWSBI Diamond 540 with a Fine nib) along with a writing sample I did. If there really is any interest then we can start a thread elsewhere. I don't want to hijack the pipe thread. Freddy, I find it interesting that under your pen you have written Gresham, Wisconsin. Now why did you pick that name? I have visited a friend there. She is a member here.